One of our clients runs an online store selling mobile phone contracts for the German market. Their marketing strategy is centered around social media marketing with a strong focus on acquisition using Facebook and Google Adwords. Aside from their presence on Facebook and Google, they also operate a blog and run TV advertisements. This strategy has made them into a well-regarded brand for their target audience, currently holding on to the second largest number of followers on Facebook among German online stores. Our client employs a Business Intelligence team. This team is responsible for the research, design, and implementation of marketing processes that involve the collection of customer data, such as their personal, behavioral, and transactional activities, and transforming these records into insights that can be used to drive acquisition, retention, and conversion strategies, by means such as segmentation schemes, on-site personalization, and email automation. They have developed a successful Customer Acquisition Targeting process that identified customers using deep segmentation. On a daily basis, their database of current customers needed to be updated, segmented into 43 different categories, exported to separate CSV files, and then uploaded to Google Ads and Facebook Audiences. The BI team conducted a Time and Motion study to investigate how much time they spent on manually performing these activities and whether any of these activities required human decision-making. They concluded that the operation of this process cost 20 man-hours/week of their time and that it could easily be automated due to the robotic nature of the process. The BI team, therefore, started to investigate how they can automate this process and seek out the ideal Customer Data Platform that would also allow them to enhance their current marketing operation. 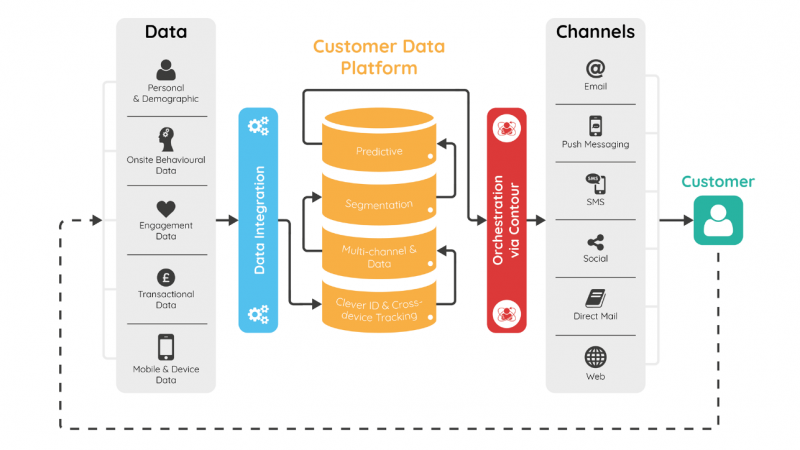 First, they defined what a Customer Data Platform precisely entails (see below diagram), and then listed the features they required from such a platform. Secondly, they sought out all vendors of Customer Data Platforms and rated their products against these requirements. They expected the candidate platforms to have a high degree of interoperability with existing marketing tools and backend systems, tracking and storage of customer data, segmentation, have the features to organize reactivation campaigns, A/B testing, and must be able to use recommendation engines. Exponea came out on top from the total of 6 vendors they have evaluated. The implementation of the Robotic Process Automation of the Customer Acquisition Targeting process took 4 weeks. 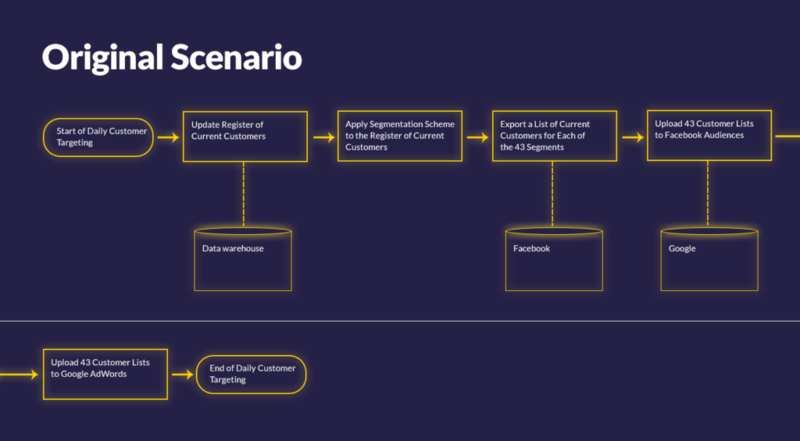 This involved the transfer of customer data, implementing the client’s segmentation scheme in Exponea, and finalizing the Robotic Process Automation. The process flow that underpins the resulting automation is described in Figure 3. Our client was highly satisfied with the Robotic Process Automation that our consultants delivered. 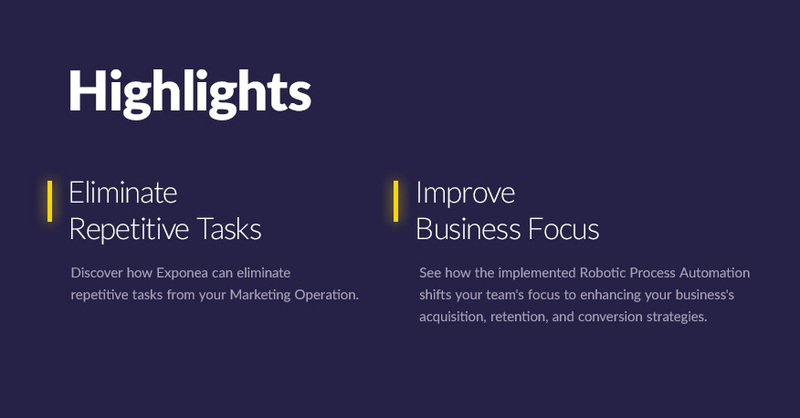 Having developed this solution using Exponea not only saved them 20 man-hours/week but also provided them with the opportunity to explore how marketing automation can optimize their acquisition, retention, and conversion strategies. Thus, shifting their efforts away from performing mundane administrative tasks to being creatively engaged in the marketing bottom line of generating revenue.